Why you should digitise video and film assets now. With risk chart. The photo above tells a story. Unfortunately, it’s not the story it was originally meant to tell. That story has been lost. Forever. In its place, there’s a story about how your precious legacy content may be at risk. Do you have video, audio or multimedia content stored on film or magnetic tape? The longer you leave it in the original format, the greater the risk you will lose it. Degradation means the physical media is damaged. It’s what happened in the case above. The risk of degradation varies according to both the specific media format and the storage environment. Good storage conditions (like the Preferred Media Vault) can reduce risk of degradation greatly. There are a number of considerations. Mould grows better in warmer conditions. Higher temperatures also increase pack tightness. Any dirt or dust particles damage more layers of tape or film. Blocking – when layers of tape or film stick together – is more common. Very low temperatures may also affect magnetic media negatively. Binder lubricant may separate out and block the play heads. Mould likes humidity as well as warmth! Binders (the material that binds magnetic particles to a base tape film) are also less stable at higher humidities. Dust and particles are a major cause of damage to fragile surfaces like tape and film. Corrosive gases (sulphides, nitrous oxides etc.) can also damage media. Fortunately this is not a major issue for us in Sydney. Even with the best storage, some media formats are simply less stable than others. If you’re thinking of digitising tape, prioritise 1 inch video, U-matic and any older formats. They’re all higher risk. Even within one media type, there may be variation over time. Improvements in technology mean later versions are often more robust. For example, the earliest writeable DVD-Rs were very unstable. Many failed within 2-3 years. Later DVDs tend to last a bit longer! Even if your media is stored in perfect conditions and survives, you still need to access the content on it. And that means you need the right equipment. Playback devices for many media older formats are no longer produced. Spare parts are hard to come by. People who know how to run the equipment are in short supply. Expertise in repairing equipment is even rarer. Which media are most at risk? 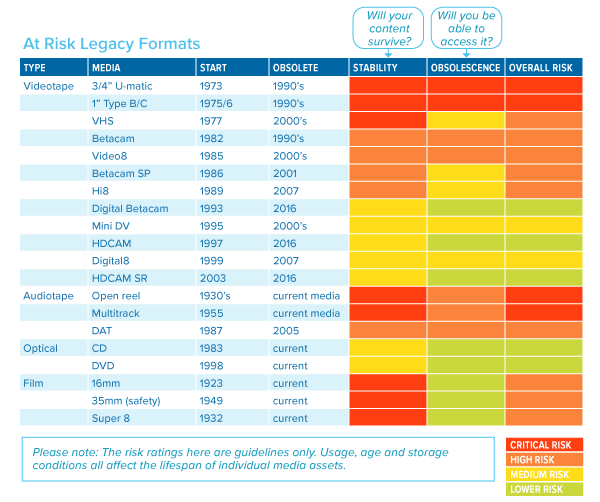 The chart below shows which pre-digital content formats are most at risk. It covers the common video and audio formats we work with. So if you want to digitise video or audio content, you can use it to set priorities. Why digitise film and video now? If you plan to use your historic content, you’ll have to digitise. That’s how content is accessed and shared nowadays. Firstly, every year more content degrades beyond the point of repair. If your material is slightly damaged now, we may be able to fix it. 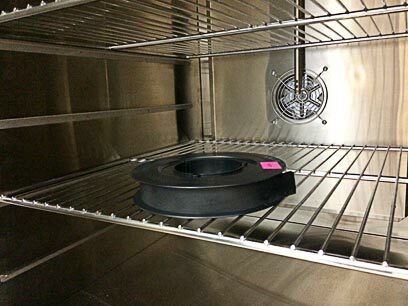 We use a specialist oven to reduce moisture content as required. Tapes can be baked to reduce moisture. But the worse it gets, the smaller the chance we can fix it. It’ll end up like that film in the photo at the top of this post. In the rubbish bin. Secondly, playback equipment is ever harder to find and use. So if you’re going to digitise video or film, there’s no time like the present! If you’d like a quote, or some guidance putting together a digitisation plan, we can help.